Reaper doesn't show any signs of slowing as they go through another stretch goal and make their way to the next. The "Orcpocalypse!" Set is now available to all pledge Levels! You'll get 20 Orcs, 4 copies each of the 5 models shown. 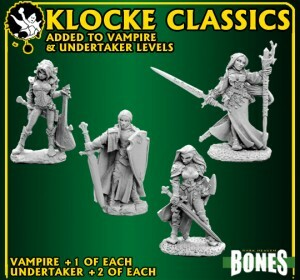 You can order just that set for a $1 Skeleton level pledge plus $25, or add $25 to any existing pledge. NOTE: Skeleton and Zombie levels will need to Add $5 for International Shipping. That's $5 for one set, or $5 for two, and even $5 for more than that! Shipping does not stack, so simply include the highest shipping value among all options and levels desired. Now it's time for some More Bones!